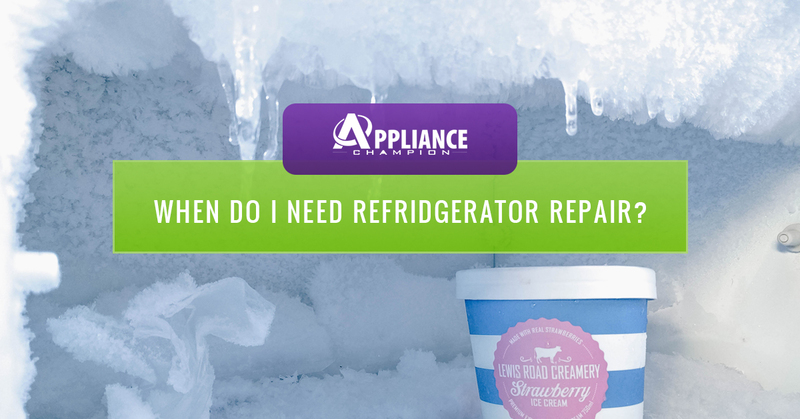 When Do I Need Refrigerator Repair? If there was any appliance that we would never want to do without, it is our refrigerator. Ultimate convenience is being able to get whatever we want — or whatever we put in our fridge — and eat it whenever we want. Having fresh food to eat is a modern-day luxury that we hope we never have to live without here in Keller, Texas. With this in mind, we dread the thought of our refrigerator not working like it used to or quitting all together. We at Appliance Champion hope you will never have to be without your refrigerator, but know that we will be there for you if you need refrigerator repair. Thankfully, when our fridges might need some TLC they will most likely exhibit some very clear signs. Keep reading to learn more about how to tell if your fridge needs some repair and if you have any questions, be sure to contact us! It’s easy to forget how much our refrigerator does for us until it quits. 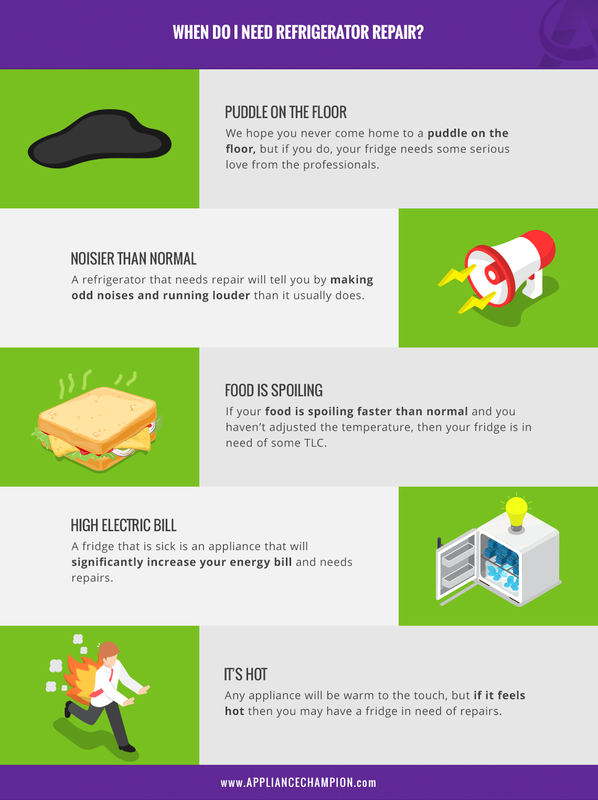 To avoid being without the convenience of your refrigerator or being stuck with more costly repairs, be sure to be on the lookout for these signs that show your fridge needs some love. If something seems off with your fridge, it’s most likely that your appliance needs attention. There are a lot of things that might piddle on the floor: your fridge, your fur baby, and a spilled bottle of soda. None of these things are fun experiences to clean up and really the only place for a pool or slip and slide is in your backyard. Cleaning up the puddle and getting your fridge fixed right away is pertinent for a few reasons. First of all, if your fridge is leaking and you don’t address the issue, you may come home to an appliance that has completely quit. Also, contant puddling water can damage your floors, adjacent walls, and floor structures, causing not only water damage, but also mold damage. There may be a few issues at work and to make sure that you aren’t left with a less than functional fridge, call your local Keller refrigerator repair specialists right away! Your fridge shouldn’t sound like it is trying to communicate with you, be the special effects maker of a movie, or make more noise than a soft hum in the background. If your fridge is running extra loud and making odd noises, it is clear sign that your refrigerator is crying out and needs some TLC. Getting the issue resolved right away is a must because if your fridge is running extra hard, then it is entirely likely that it is overcompensating for another part that is broken or it may be the part itself that is near the end of its life. Your fridge should never dominate the conversation or give you a headache. Call your Appliance Champion refrigerator repair specialist right away. Regardless if you like going to the grocery store or it is your least favorite place to frequent, having to buy food that you just bought is frustrating because it not only takes more time out of your day, food isn’t cheap — especially if you decide to shop organic — and food poisoning is not fun. Your food should not spoil before its expiration date. If it is, it is possible that you need to turn up the temperature of your fridge due to the temperature of your home or the fact your fridge is stuffed to the gills with eats and treats. If you have your refrigerator set to an adequate temperature and your food is spoiling, this may be a sign that your fridge is about to quit on you. Don’t put yourself through the frustration of losing good food early — especially those leftovers from your favorite restaurant — and later coming home to a fridge that has completely quit. There are a lot of things that may cause a high electric bill: inefficient appliances, running the AC hard during the hot Keller summers, and a fridge that needs some love and care. If you have cleaned your HVAC system, turned your AC down, and invested in energy efficient appliances, then it may be time to examine your fridge. In many cases, if your electrical bill is high, your fridge will be showing a few more signs that it is in trouble, such as running hard or running all the time, and running hot. Protect your pocketbook, your investment in food, and your fridge by getting your appliance fixed as soon as possible. Any appliance, just like your car, will be warm to the touch when it is running, due to the use of electricity and conversion of that energy into the task at hand. However, your fridge should never be hot enough that you can cook eggs on it and give your range the day off. A hot running fridge means that something isn’t quite right and that possibly one part is overcompensating for another part that is working sub par or not working at all. No matter what the issue is, if you notice that your fridge has a fever, call your refrigerator repair specialists right away! Running hot for an extended amount of time can create even more damage and cost more to repair in the long run. We understand that calling for appliance repair especially refrigerator repair isn’t your favorite thing. However, if you call Appliance Champion, you can assume a few things. You can assume that we will do our best to arrive the same day that you call and that when we arrive we will bring the exact brand-name part needed to fix the issue. Also, we will always take the time to explain the issue, the needed fix, and the on-going maintenance needed to keep your refrigerator running for months and years to come! Learn more about our refrigerator repair services and contact us to experience our five-star, customer-focused service! We also offer $25 off!